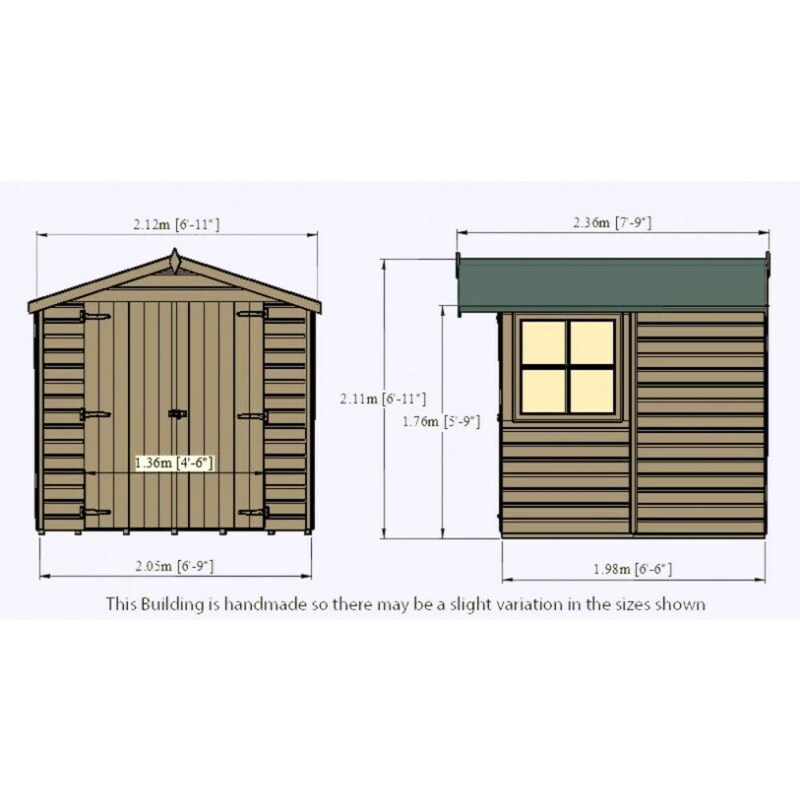 Buy Pressure treated overlap double door shed 7 x 7: <ul><b><li>Made in the UK</li><li>Robust slow-grown timber</li><li>10-year anti-rot guarantee*</li></b></ul><br>Attractive 7x7 timber shed with double doors for better access to mowers, tools, furniture and equipment.<br><br>Built from rough-hewn 6mm pine cladding on a 34mm square frame, the generous 176cm eaves height allows easy storage and retrieval of taller items.<br><br>Both the 8mm roof and 11mm floor are made from solid OSB sheet with exceptional weight-bearing properties, and the sturdy double doors are fitted with a hasp and staple catch ready for padlocking.<br><br>A diamond finial and Georgian-style opening window glazed with safety styrene add a decorative finishing touch.<br><br>Pressure treated to improve resistance to fungal decay and insect damage; supplied with a 10-year anti-rot guarantee. Includes fixings, green mineral roof felt and full assembly instructions.<br><br>Measurements (approx):<br>H211cm x W205cm x D198cm (W212cm x D236cm including roof overhang)<br><br>*Guarantee subject to the following conditions:<br><br>a) The shed must be treated with a high-quality, spirit-based timber preservative prior to or shortly after construction.<br>b) The anti-rot guarantee covers the timber against fungal decay and insect attack only. It does not cover movement, warping or splitting of the timber over time; damage caused by or as a result of misuse; glazing material, joinery or roofing felt.<br><br>For further details and exclusions, see www.shiregb.com/warranties. These terms and conditions do not affect your statutory rights. Attractive 7x7 timber shed with double doors for better access to mowers, tools, furniture and equipment. Built from rough-hewn 6mm pine cladding on a 34mm square frame, the generous 176cm eaves height allows easy storage and retrieval of taller items. Both the 8mm roof and 11mm floor are made from solid OSB sheet with exceptional weight-bearing properties, and the sturdy double doors are fitted with a hasp and staple catch ready for padlocking. A diamond finial and Georgian-style opening window glazed with safety styrene add a decorative finishing touch. Pressure treated to improve resistance to fungal decay and insect damage; supplied with a 10-year anti-rot guarantee. Includes fixings, green mineral roof felt and full assembly instructions. a) The shed must be treated with a high-quality, spirit-based timber preservative prior to or shortly after construction. b) The anti-rot guarantee covers the timber against fungal decay and insect attack only. It does not cover movement, warping or splitting of the timber over time; damage caused by or as a result of misuse; glazing material, joinery or roofing felt. For further details and exclusions, see www.shiregb.com/warranties. These terms and conditions do not affect your statutory rights.